I have on occasion written down, both here and in other scribblings, my thoughts on selective trout and that supposedly mythical beast the “educated trout”. Of course that has equally led to a level of derisive commentary from some, sufficiently determined argument that can on occasion have me questioning if I have missed the point and simply bought into the concept that fish learn from their mistakes if given the opportunity. Indeed there was a time when I discussed the idea that there were no such things as selective trout and that the angler’s long held belief was simply an excuse for poor angling ability.. you can get yourself into a lot of trouble making known such thoughts, particularly if you are not careful about who you might offend. In fact I have of late been reading through an entire book on the subject, “What trout want, the educated trout and other myths” by Bob Wyatt, (Stackpole 2013) and it makes for some interesting cerebral gymnastics. Trouble is that there are still things that happen out on the river which suggest that fish do indeed become educated. 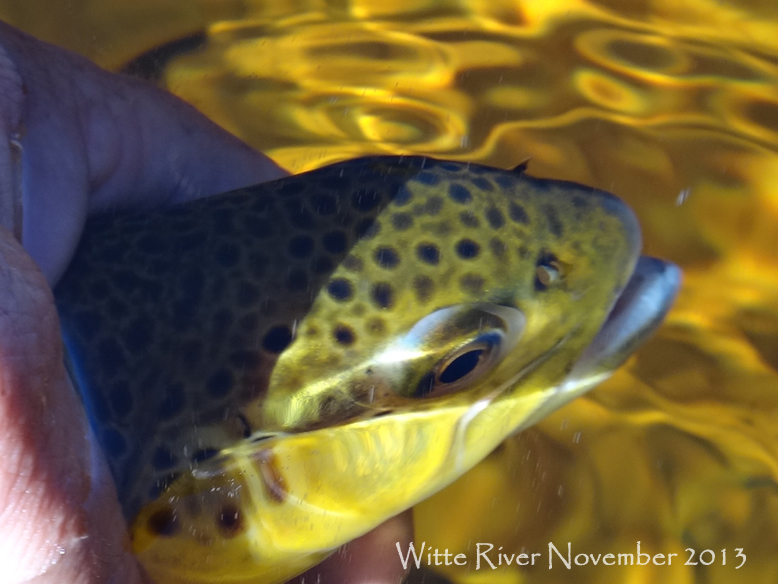 I don’t believe that they are going to fuss overly that the rib on your March Brown is slightly the wrong shade or that you have foolishly tied in four tails instead of three but fish that receive more angling pressure behave differently to those which don’t, of that I am pretty darned certain. 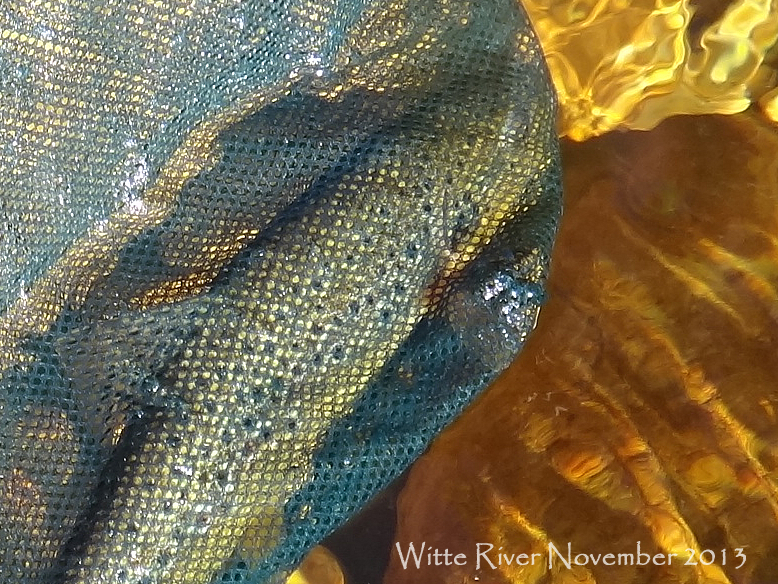 Educated or not, the trout on this stream are exceptionally pretty. 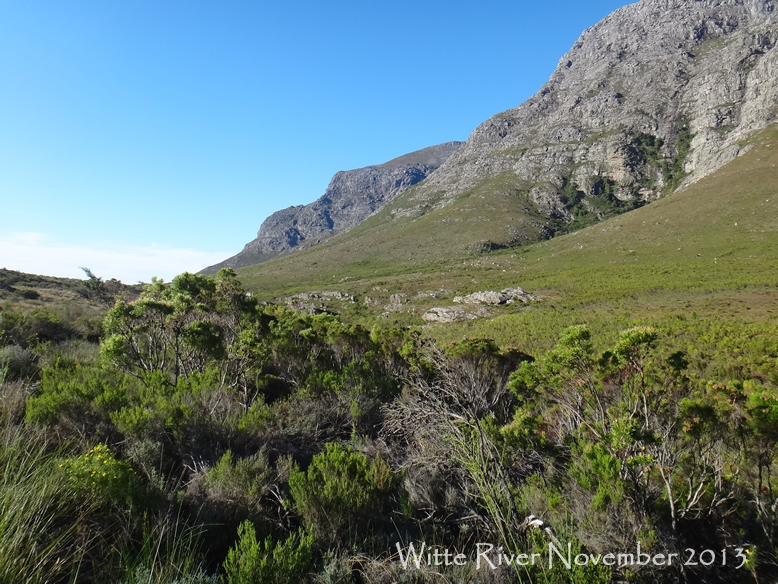 Take for example a recent trip to the high country of the Witte River in the Western Cape, a long haul hike up a pretty steep mountain to reach a river that has the longest history of Catch and Release angling of all our local streams. The water is crystal clear, holds relatively few fish and is renowned for being tricky. Personally I don’t think that this river is particularly technically demanding but to be sure you don’t get that many chances at a fish in the course of a day, so errors tend to have a significant influence on your catch rate. Not so much that the trout are harder to fool but more that if you do miss a couple of opportunities you could easily be making the long walk back to the car with a dry net. Into the high country in search of naive trout. So it was that having not visited this particular watershed for some time and drawn by the lure of complete isolation, quiet fishing time and spectacular scenery I headed off alone, high into the hills. Now hill country in general and this valley in particular is known for vagaries of weather, it is almost entirely impossible to predict and despite checking the weather forecasts and such one can find local climatic conditions changing suddenly as you gain elevation. Driving up Bain’s Kloof Pass to the start of the hike into the valley I meandered through areas of complete stillness and the next moment had the car rocking in the gale. In the nearby town of Wellington the smoke from barbeque fires was floating straight up into a clear blue sky, on the pass the trees were bending dangerously as the air funnelled down the valley at near hurricane force. Adopting the “you are here you might as well fish” mantra of the dedicated angler I headed uphill, puffing and panting to reach the stream. The wind wasn’t quite so bad on the high ground but still represented more than a bit of a challenge, buffeting downstream and into my face. I am a great believer in the benefits of careful fly presentation, which normally then begets long leaders, small flies and fine tippets, but after a few practise casts it was obvious that such a rig wasn’t going to offer much hope under the conditions. I cut back the leader to around 12’, forwent the benefits of fine 8x tippet in favour of more sturdy stuff and lashed on a large hopper pattern which when damp could at least be persuaded to cut into the gale and land, albeit with something of a “plop” roughly where I was aiming to throw it. At least I got to wet the net. I fished on, searching likely runs, there were a few hoppers about and the wind should be sending the odd hapless individual into the stream, I figured that I was at least in with a chance of a fish. This is a notoriously bushy bit of water requiring some pretty gung ho orienteering to gain access to certain parts of the stream. Eventually after much struggling and rather splashy casting I came to a run amongst the bush where a trout held over a flat rock feeding merrily and occasionally coming up to the surface to engulf some tiny morsel. I decided that the hopper and the short leader just weren’t the ticket and re-rigged to a finer set up with more and thinner nylon and set about casting for my prize. The first cast looked good but was ignored by the trout so I changed flies, the second cast was a tad too far to the right and the third ended up with the line snagged in the bush. At some point during the retrieval process the fish must have got a glimpse of me because when I turned around he was gone. Never mind early days and I pressed on in search of new quarry. The long leader set up really was troublesome so I reverted to the hopper and the shorter stiffer terminal tackle, bashing the fly into the gale in likely looking spots all to no avail. 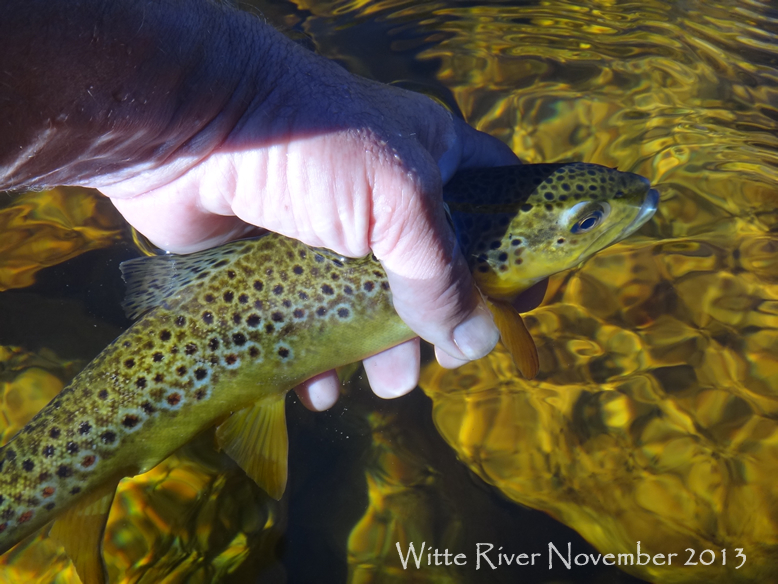 Then, finally another trout, a big one and holding in the tail out of a long smooth run, feeding quietly in between two tufts of river grass and oblivious to my presence. This time I figured I would stick to the hopper despite the slow flow and made what I thought was a good cast, slightly to my side of the fish and a fraction behind his head. I figured that the “plop” of the hopper would be sufficient to induce him to spin and engulf the pattern. Not a chance, he spun around for sure, had a good look at the fly and bolted for the bankside brush, obviously less than impressed with something, either the fly or perhaps the tippet. I fished on, things were looking a little grim, on this notoriously understocked river (actually it isn’t stocked and hasn’t been for decades), I thought I might be facing my first ever blank day. I have always managed to scratch a fish or two, even under the most trying conditions. Finally I fooled a small fish, at least the blank was avoided and it heartened me that the small fish was evidence that the occupants of this remote water were still managing to find the odd partner and breed. Most encouraging as their hold on survival is at best a little tenuous. I hiked higher up the valley, reaching waters that are rarely fished, the flow was becoming minimal and much of the river looked far too shallow to provide trout habitat. By now almost two hours from the car and a long way above where most anglers would turn back I threw the hopper into a shallow run with a slight depression amongst the boulders and got an instant hit. A nice fish and my second for the day. The next run I overcooked the cast, the hopper and the tip of the fly line splashing down hard into the water as the wind momentarily abated and I turned away in disgust at my error. When I turned back the hopper was gone, replaced only with the swirling rings of an obvious take, the ripples rapidly being flattened out by the still onerously strong breeze. I struck late and hooked a really good fish, surprised that it would swallow such a poorly presented fly at all. The next run and another fish, then another. High up in the valley where the angler’s trail all but peters out and where one imagines few ever cast a line the fishing became easy. Presentations, even poor ones frequently resulted in a take. 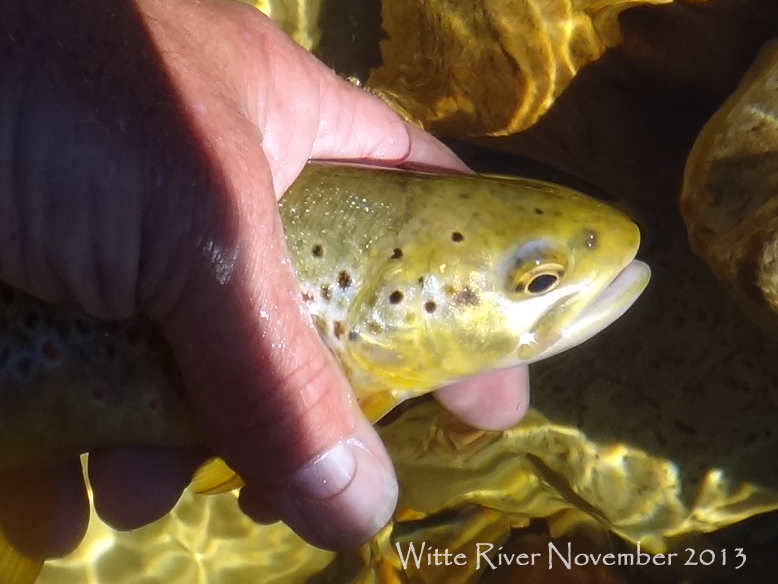 The hopper splashed down, the fish rose up and I took trout almost at will from virtually every piece of water that had a little bit of depth. After a poor start I ended the day with ten or so wild brown trout, some of pretty reasonable dimension and no doubt could have landed more but for the pressing need to turn tail and head home before it got too late. Were it not for the need to hike back I probably could have increased my tally. In the end I can’t come up with a better explanation of the day other than to suggest that the higher I went and the less fishing pressure the water received the more naïve the trout became. So perhaps “The Educated Trout” is a myth, but if that is the case how do you explain the concept then of the “Uneducated Trout”? Are they not opposite sides of the same coin? The browns high up in this valley, which one presumes are rarely troubled by anglers machinations were heartbreakingly naïve, foolhardy to a near suicidal level. If I were honest, the only real difference I can come up with is that they haven’t had the chance or necessity to learn better.